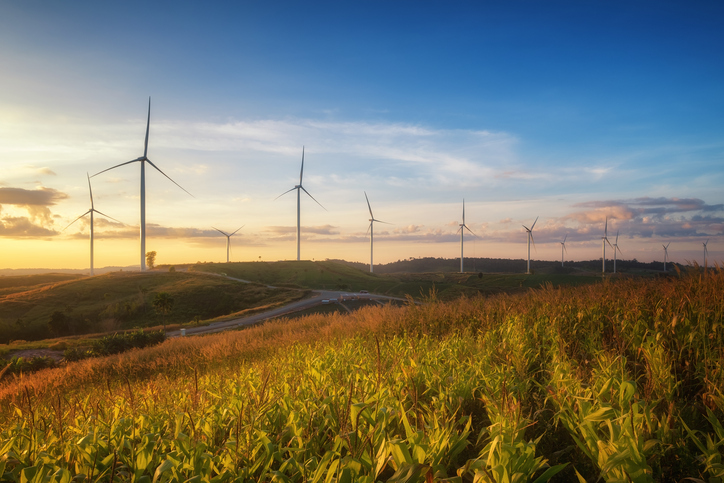 The standard configuration of a wind turbine gearbox may not match the designed field reliability defined by the OEM and/or gearbox remanufacturing facility. 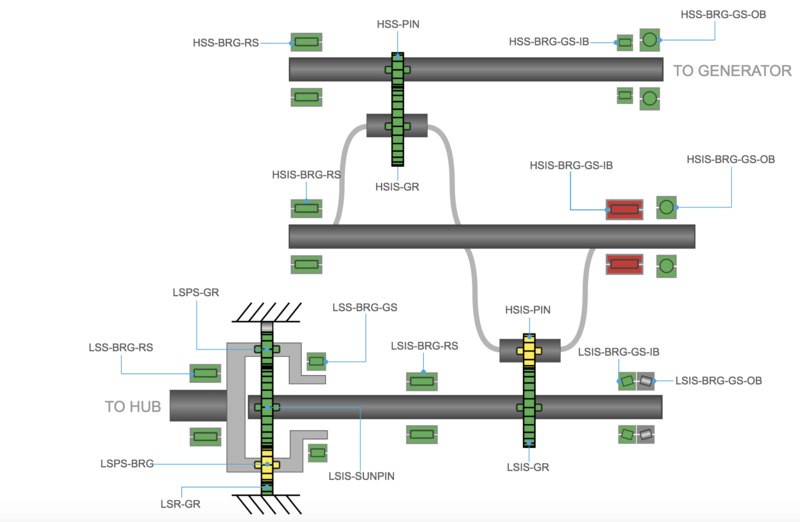 Empirical operational data for gearbox sub-components deployed in the field shows that the gearbox internal components (including the gearbox housing) do not typically perform according to the L10 mechanical design life expectations. In some cases, the fatigue life performance of drivetrains verified with physical test rig-based confirmation testing, when compared with drivetrains exposed to the transient loads and weather extremes of wind farms, can be calculated to have a variance in life of ~68% difference. Although gearbox reliability has improved over the years, gearbox failure rates average 6.97% and remain a key topic based on the overall cost of a complete gearbox replacement and up-tower repair(s). The risk associated with purchasing gearboxes, without full knowledge of the bill of materials (BOM), has resulted in repeat failures of similar components. The financial impact of replacing components “part for part” without an upgrade strategy has resulted in a significant budgeting gap. One point of view has been a lack of collaboration between the wind turbine design engineers and the supplier engineers who provide the individual gearbox sub-components. As a result, the owners/operators of the equipment are left to perform an analysis on the failed components, developing options for repair/replacement without the direction of the gearbox OEM who retains the gearbox configuration information, or who may not have the depth of knowledge of the turbine-specific operational conditions to provide the appropriate recommendation(s) for gearbox life extension. Sentient Science’s DigitalClone® mainstreams the ability to perform physics-based computational testing for the internal subcomponents of the gearbox– the ring gear, pinion bearing, intermediate gear and bearing. This advanced technology empowers the owners/operators to select the best component based on life and price to align with corporate benchmarks set forth to reduce operational costs and increase asset optimization. Sentient Science has provided a disposition of a rotorcraft “super gear” validation. This particular program required the development of an option for an advanced gear material that would match design guidelines for new engine requirements. Sentient evaluated the super gear endurance limit (1E+10 cycles) and calculated 180 Ksi as opposed to 155 Ksi. The additional endurance limit resulted in an 18% gain using the super gear’s advanced materials. Based on the case study, Sentient applies the same rigor to the energy sector for the best sub-component selection to meet corporate objectives. For drivetrain components and systems, with a heavy emphasis on gears and bearings, computational testing can evaluate a statistically significant number of design and test variations to capture the required level of variance within the materials, surface roughness, residual stress, lubricant effects, macro and microgeometry, assembly variations, and transient loading conditions that will be experienced in the field. 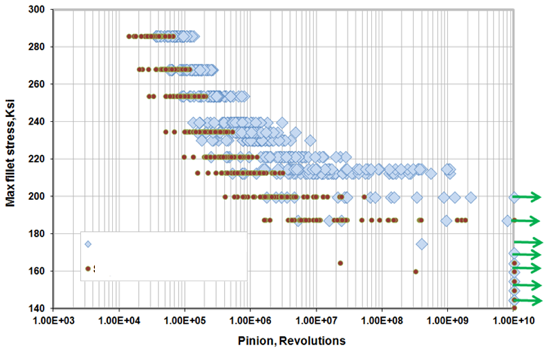 Computational testing, when properly implemented, acts as a complement to the physical testing process, evaluating 200+ iterations of the data points tested using the relevant parameters. A forecast of true equipment performance by evaluating the design of the gearbox using operational load regimes to predict the life of the drivetrain’s actual reliability in the field. The technical detail is applied to corporate initiatives through the lens of business value for project viability. Sentient has several contracted projects for mainstreamed application of the internal component selection process. Sentient takes a strategic and methodical approach to the application of “business value,” in relation to opportunity capture and reducing gearbox failures over time. 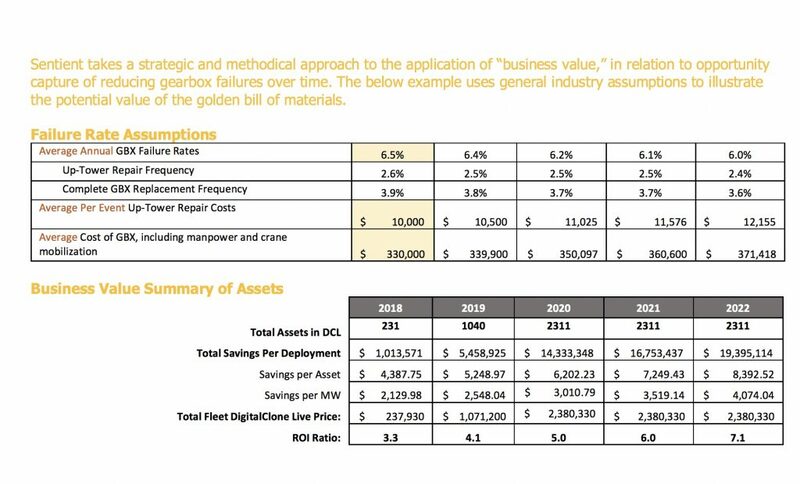 The below example uses general industry assumptions to illustrate the potential value of the golden bill of materials.